The Peoples Democratic Party, PDP Chairman in Osun State, Hon. 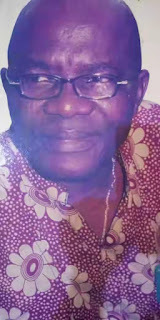 Olasoji Adagunodo, FNIQS, has described the late former Chairman of the party in the state State, Alhaji Ademola Rasaq popularly called LANDERO as a political hero of all times whose political sagacity and grassroots mobilization remain unbeaten. Adagunodo made this known on Wednesday in a 5 years remembrance anniversary of the late icon. Hon. Adagunodo narrates how the former party boss used his wisdom to stabilise the party and contributed immensely to the State government during Prince Olagunsoye Oyinlola-led administration. He said, "Landero used his wealth of experience as an astute administrator to guide the administration of Prince Olagunsoye Oyinlola-led PDP government in the management of both the government and people of the State without rancour". "It was also corroborated sometimes ago by Prince Olagunsoye Oyinlola that Alhaji Ademola Rasaq was 'a man who was so contented with what he has as he never asked for anything for himself but for the ordinary masses of the State who supported PDP to displace the administration of Alliance for Democracy in Osun state." "Landero, apart from being my personal friend was fair to a fault and was always disturbed if any human being was in pains and this led to his extreme generosity of giving all he had to party members and non party members who were lucky to find their way to him. The party boss added. "The death of Landero on November 15, 2013 sent a shocking wave to the spines of many people who knew and were closed to him because his demise definitely shut down the sources of many people's source of sustenance, people usually called him "IKÒKÒ OBÈ" meaning POT OF SOUP and true to that fact quite a number of indigenous contractors were lucky enough to be fully involved in the development of the state. "His pedigree, antecedents and track records remain unbroken today in the entire region. A critical look at the administrative setup of the ruling party in the country today that is characterized with capital flight and lack of feelings for the local and indigenous people in virtually all the states of the federation has placed the late chairman of PDP in Osun State, Alhaji Ademola Rasaq on the highest rating of politicians who cared for the citizens. "Alhaji Landero will remain an indelible ink in our minds, his steps that were engraved on the stone will last for ever in our memories. His brotherly love to all irrespective of political association will remain unbroken. His personality will remain forever. Landero, we will love you for ever". The statement concluded.